Welcome to our Spa/Hot Tub Moving specialty section. We have moved just about every make and model through just about every possible terrain. Moving a spa is not something people should do on their own. These items weigh 1000 lbs on average and require a team with experience and patience. Please make sure to read this section completely, it has VERY valuable information about what you would need to know before hiring a spa / hot tub mover. Measure the spa / hot tub. Our pricing is based on many factors, the size of the spa / hot tub is one of these factors. Make sure that the spa / hot tub is disconnected by your licensed electrician or any licensed electrician. The spa / hot tub must be drained prior to our arrival. Draining a spa hot tub can take up to 3hrs! EXTREMELY important: The most common problem when moving a spa is forgetting to measure the most important areas… the house awnings/roof corners . Make sure that you measure both locations. Schedule the pick up time with the selling party (if purchasing the spa / hot tub from somewhere). We can dispose of your spa / hot tub. Most of the time a spa / hot tub that needs to be disposed of is either mechanically broken, leaking or too old to sell. We have a few ways of disposing of a spa / hot tub. Simply move it out if it fits through the side of the house or whatever path it needs to go through. still getting the job done correctly. Are you a retail store and need movers on a regular basis. Give us a call! 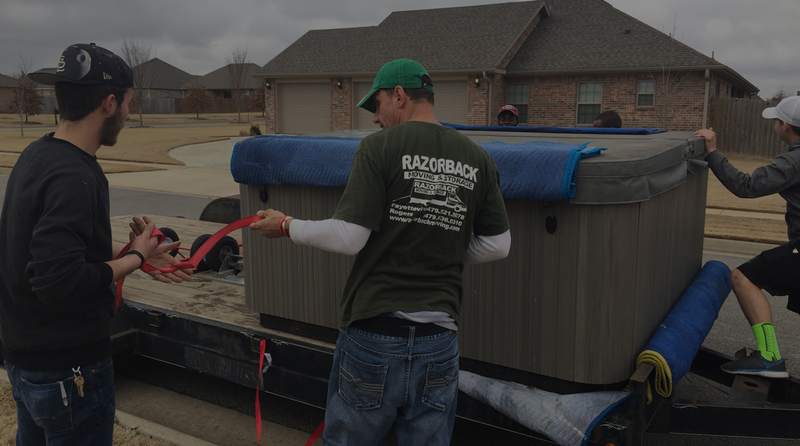 Specializing in Hot Tub Moving. For ALL makes, models, and brands. 27 Years in the Hot Tub Industry, Knowledgeable in ALL Models and Manufacturers, Call now for a FREE Moving or Removal QUOTE.